Soon after his release of three weeks of illegal house detention, Hurriyat Conference (M) chairman Mirwaiz Umar Farooq visited the residences of three recently martyred youth in downtown Srinagar including Mehrajudin Bangroo and Rayees Ahmed Sofi of Fateh Kadal and Faid Mushtaq Waza of Khanyar and expressed his condolences and solidarity with the bereaved families. Consoling the grieving families Mirwaiz said that Kashmir is in the grip of forcible control and these martyrs were martyred on the path of defending truth and seeking justice for their oppressed people. Had GOI honoured its commitment to the people of Kashmir instead of subjugating them by force, no youth would feel forced to resort to arms to resist oppression and painfully lay down his life. 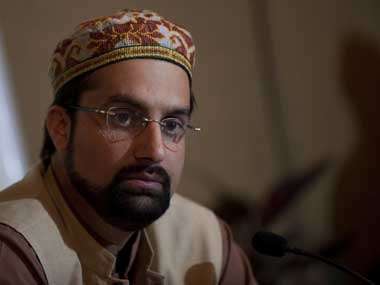 In a statement issued by Hurriyat (M) spokesman said that emotional scenes were witnessed when Mirwaiz met martyr Rayees Ahmed Sofi’s family who are putting up in their neighbors house as their home was blasted and completely devastated by the forces. His aged father broke down when he narrated how his son was first severely tortured and then brutally shot dead by the forces, his young wife still in shock unable to talk with her one year old son tugging at her. The spokesman said everyone including the Mirwaiz could not hold their tears seeing little boy with his young mother. Similar pain and grief was witnessed at the house of Mehrajudin Bangroo and Faid Mushtaq Waza. Talking to a large group of people present at Fateh Kadal Mirwaiz said that seeing the patience, resilience and courage of the families of the martyr’s, no power on earth can stop people of Kashmir from achieving their birth right to decide their destiny. Mirwaiz said we have faith that the supreme sacrifices being offered by the youth and people of all ages across Kashmir will bear fruit. Meanwhile, Hurriyat Conference (M) spokesman strongly condemned the use of brute forces against the peaceful protestors in Sopore area of Baramulla stating that an all out war has been declared against the people of Kashmir where there is no scope for even peaceful protests and the move deserves all forms of condemnation. Police asserted details regarding security shielded for Kashmiri separatists.